This convenient online diagnostic gives team leaders, team members, and interested stakeholders, a way to compare their view of the team’s strengths and weaknesses to a proven model of team effectiveness used by thousands of teams worldwide. The Team Diagnostic™ is a unique approach because it regards the team as a dynamic “system.” A team is more than the sum of its parts. A team is a living, dynamic entity with its own personality, spoken and unspoken rules, vision, blind spots, even moods. With the Team Diagnostic™ the team’s needs are explored independently of the needs of any single member. This shifts the attention and the work to the team as a whole. Research shows that the most successful teams have the means to take action and build effective relationships to motivate and sustain that action. 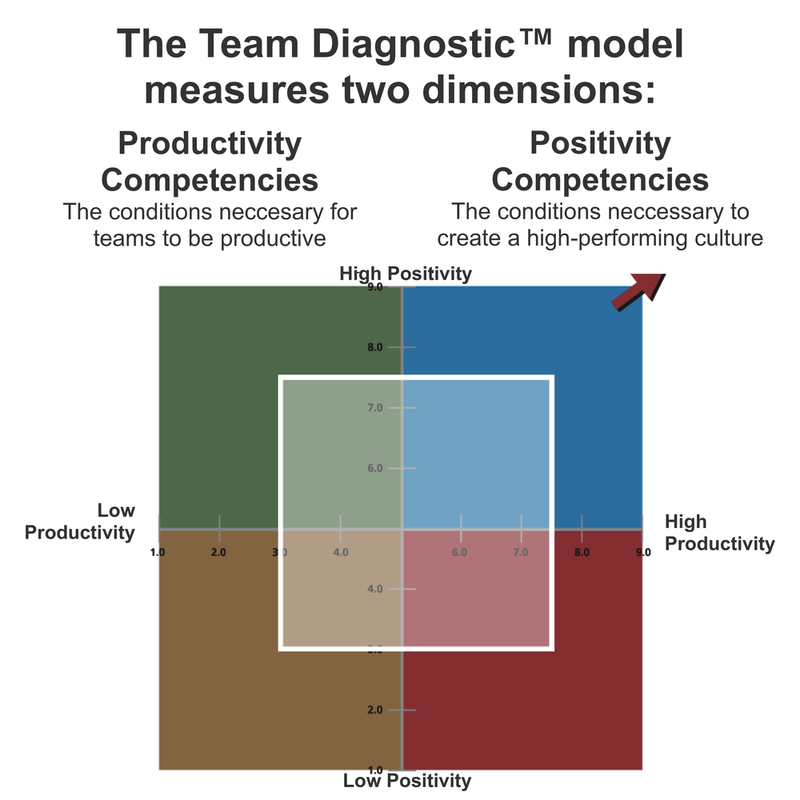 The Team Diagnostic™ is built on these two fundamental axes: Factors that optimize productivity and factors that optimize positivity. The model defines and measures seven separate productivity factors and seven positivity factors. This constellation of competencies and increasingly detailed layers of reporting provide a complete picture for creating and maintaining high-performing teams. Teams that excel at both dimensions are high performing and sustainable. They are creative, adaptable and resilient. This assessment view gives team leaders a way to compare their view of the team’s strengths and weaknesses. This diagnostic also shifts the mindset from leadership of individual performers, to leadership of the team as a whole. For leaders this view is also leadership feedback and a measure of the impact of their leadership. This view provides a self-determined baseline for the team and a map for moving forward. In the end, it is the team that will decide the course direction for the next phase of the journey. In this view the team productivity, positivity, dynamics and culture, are revealed to the team in a way that everyone can understand. This perspective gives the team invaluable information from the people whose opinions matter most: the people who are served by the team every day. This diagnostic view can be used with a division, a large department, an entire organization, or a representative sample of the organization. The final report can be segmented to show overall results as well as results from subsets of the diagnostic. For example you could compare the view of IT with finance, or manufacturing. “The Team Diagnostic systems-based approach to working with teams is breaking new ground in that it creates a mindset and skill set that takes the focus off of individual team members’ relationships and creates a new perspective on the team as its own entity. The Team Diagnostic™ tools are trademarks of Team Coaching International. Graphics, text descriptions, and specific models are ©copyright of Team Coaching International and are used here with permission. RESOLOGICS is a certified facilitator for the delivery and interpreting of these assessment tools.